Vorlons were generally responsible for the emergence of telepaths in at least most of the younger races (although I think it was said to be "all" of them that had them, but I'm not sure). Were there naturally-evolved exceptions in some races? Otherwise, the Vorlons did alter them, in that way. Weren't the Drakh also telepathic? No cross species, but between themselves? Or was that more a Techno-mage electron-incantation style form of communcation? That is, more technological then genetic / evolutionary? They didn't seem to be idealistically inclined one way or another, but lived almost strictly for their own pleasures and ambitions--which would probably make them easy pickings for Shadow manipulation, without any direct worship per se (or even awareness of them). My impression is that the Centauri weren't involved with the Shadows or Vorlons prior to the time of B5. Morden talking to Londo was their first contact with them. It was an advantage for the Shadows that the enemy Londo had was the race without telepaths. And the Centauri had telepaths--and Vorlons were generally responsible for the emergence of telepaths in at least most of the younger races (although I think it was said to be "all" of them that had them, but I'm not sure). In dialogue, I'm pretty sure that we only ever hear that the Vorlons created human telepaths. There is the scene in "Secrets of the Soul" when Byron picks up Lyta's memories of the Vorlon homeworld that shows some other species but I can't recall which ones. them over the course of centuries. ...so I suppose he got that from Lyta's memory of being in the tank. What I've never decided is whether that was actually Lyta's memory - when they added her gills, perhaps - or whehter it was similar to what she experienced when she scanned Kosh in "The Gathering" and was projecting herself into another person's memories. Oh I forgot that speech from Byron. I haven't quite made it up to the fifth season in my current run-through. I was thinking that those were Lyta's actual memories of when the Vorlons made modifications to her to increase her powers. This is a fantastic season-ending episode. There's so much good stuff in it. I love the Frederick Lantz visit! He's so kindly and grandfatherly and everyone believes things are going to go well, and then he does the opposite of what everyone expects! "We will at last know peace in our time!" A nice example of doing the wrong thing for the right reasons, and perfectly realistic. 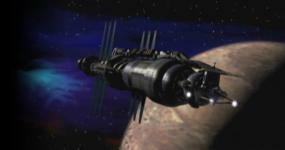 Nothing is ever simply black and white in Babylon 5, and that's why it's great. Welles and the nightwatch are great, too (why does he look so familiar??? Oh, right, Neroon). They are getting less subtle, and more creepy. Keffer and the Shadow ship .. Very creepy and ominous. A great ending for the episode. I have a minor quibble with it, in that Keffer ejected the recording before the Shadow ship fired at him, yet the shooting part is included in the video. Maybe it was still recording as it was ejected, and only stopped when the connection between it and the starfury was broken when it exploded? HAHAHA!!!!! I had to pop in because I just watched this episode again and I chuckled at one of the most awkward moments in B5 history and wanted to say something about it. Sheridan has just learned that Frederick Lantz has come to B5 to sign a Non-Aggression Treaty with the Centauri. So the entire time he is venting his anger and frustration to Ivanova, while she is going along doing the same thing, she is concealing gift for him behind her back and looking for an opening in the conversation to bring forth the her surprise. When you think about it is so priceless. Here are two people basically freaking out over the news they just learned, but one of them is concealing a gift for the other. It just seems so awkward and brilliantly real. And the gift itself is a bit awkward under the circumstances. Yes it seems to be a poignant reminder, but is it something he should or would display in his office or quarters? I mean it is definitely something that would spark more negative reactions from the Minbari. They are already touchy about Sheridan and The Black Star, so what would happen if they learn he has an actual piece of the ship as a trophy?! Nothing ever comes of it, but if one were seeing the episode for the first time one might ponder that there could be future repercussions if the Minbari learn what Sheridan now owns. All around a brilliantly bit of nuance that adds to the B5 tapestry. Nothing ever comes of it, but if one were seeing the episode for the first time one might ponder that there could be future repercussions if the Minbari learn what Sheridan now owns. All around a brilliantly bit of nuance that adds to the B5 tapestry. One does kind of have to wonder if Delenn ever sees it and finds out what it is. "You had a piece of the Black Star in our quarters and didn't tell me!" "You started the war and didn't tell me, fair's fair." Exactly my thinking. And by this point we know Sheridan has to think to himself that it can't really be something he could proudly display while on B5, especially in front of Delenn. And since everyone just seems to visit everyone else in their quarters he has to know he'll have to hide it there too. All and all could this actually be considered a thoughtless gesture on Ivanova's part? We definitely don't get enough of Delenn and Sheridan's awkward conversations. I REALLY want to see the one where they discuss that one time during the Earth / MInbari War where she was going to have him executed and then changed her mind. The way I see it playing in my head is she whispers it in his ear in bed just before rolling over and saying goodnight. The conversation I want to see is the one where he bought her lingerie and she hesitated about wearing it. Oh to have an electronic eye on the shelf for that one.